All-weather ability meets designer style. 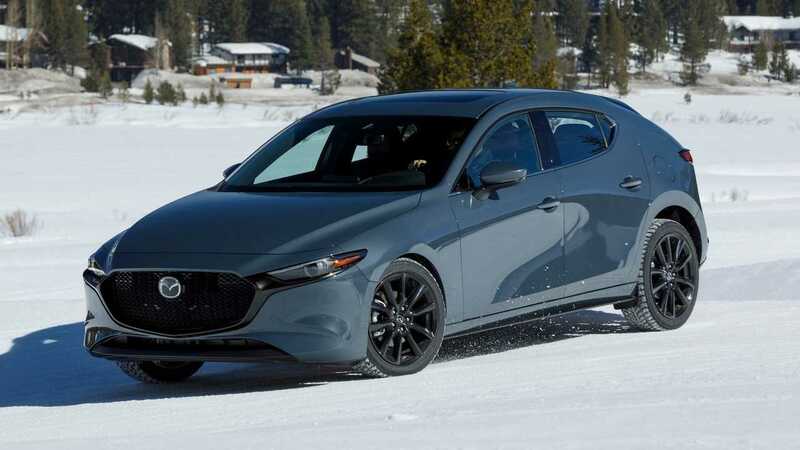 Long a front-wheel-drive-only proposition, the 2019 Mazda3 sets itself apart from the compact herd with its first all-wheel-drive system. We’ve already had a go in the two-wheel-drive 3, but today’s video and feature will focus on the all-wheel-drive version and how the new drivetrain impacts the little car’s character. 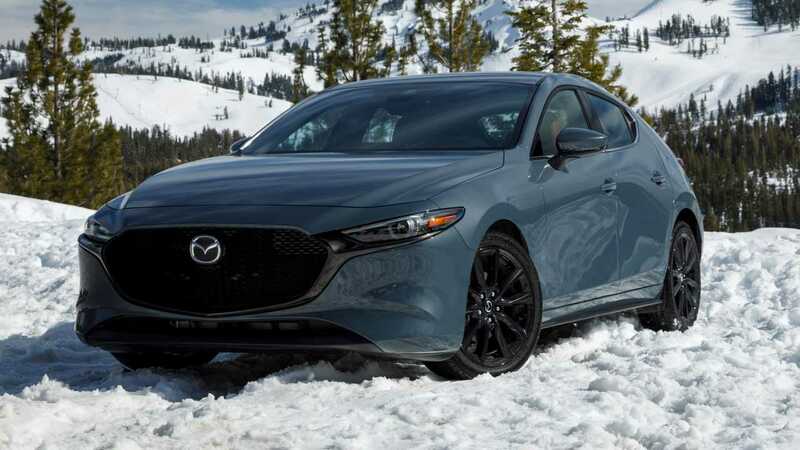 To test the 3’s driving credentials, Mazda brought us to Squaw Valley, California, approximately seven miles from the pristine shores of Lake Tahoe. At 6,000 feet above sea level, the mountainous terrain provides a perfect winter playground to test the 3's new all-wheel-drive setup before we descended into Sacramento (where it was already springtime) for testing in everyday conditions. If you’re a customer that deals with less than ideal weather, then the all-wheel-drive 3 is likely your best bet without succumbing to crossoverdom. The new drivetrain works alongside the same naturally aspirated 2.5-liter four-cylinder engine as the standard 3, while a six-speed automatic is the only transmission available. Despite our own wishes to the contrary, Mazda is not offering an all-wheel-drive 3 with a manual gearbox (for now). The carryover engine is good for 186 horsepower (139 kilowatts) and 186 pound-feet of torque (252 newton meters). Similarly, the transmission is mechanically identical to the 2018 car but includes a few software tweaks for smoother shifts. Aside from the new drivetrain, though, the biggest news is the switch from a multi-link rear suspension to a torsion beam, which in the AWD car is bent over the prop shaft. The alternative was to jack up the 3’s ride height, and, well, Mazda already has crossovers. My first hour with the 3 was spent on the snow comparing the AWD model to the FWD version. Unsurprisingly, the AWD-equipped car felt substantially more stable on the powder, as it clung through corners with impressive grip and stability. The front-wheel-drive 3 held its own driving through the snow, but felt more unpredictable without power flowing to the rear wheels. Unsurprisingly, the AWD-equipped car felt substantially more stable on the powder. G-Vectoring Control (GVC) Plus comes standard on every Mazda3, including front-drive models. 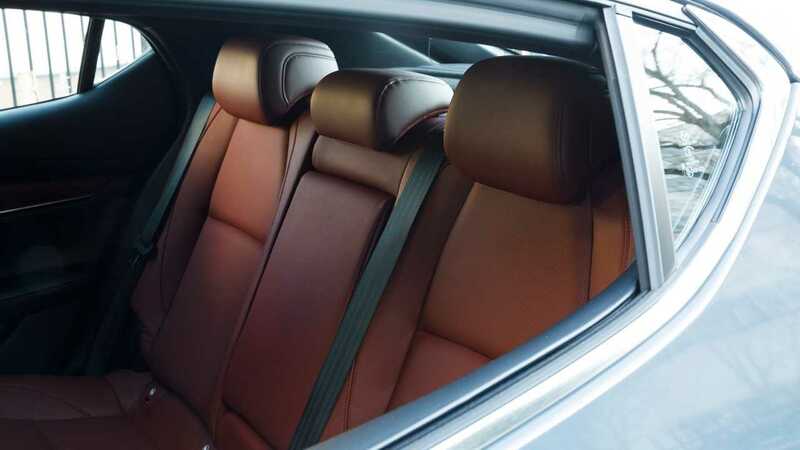 The setup imperceptibly reduces engine torque to move mass to the front of the vehicle and improve the car’s steering response through turns, while also applying light braking to the outside wheels to assist in returning the steering wheels back to center upon exiting a turn. In the snow, the two systems complement each other like Batman and Robin (no, one doesn’t inevitably end up getting captured). The all-wheel drive does most of the heavy lifting through powdery turns, but GVC Plus steps in as needed to help the car keep its nose pointed in the right direction. Even with a boot full of throttle and aggressive steering to intentionally throw the car off balance, the GVC worked gently and quickly. 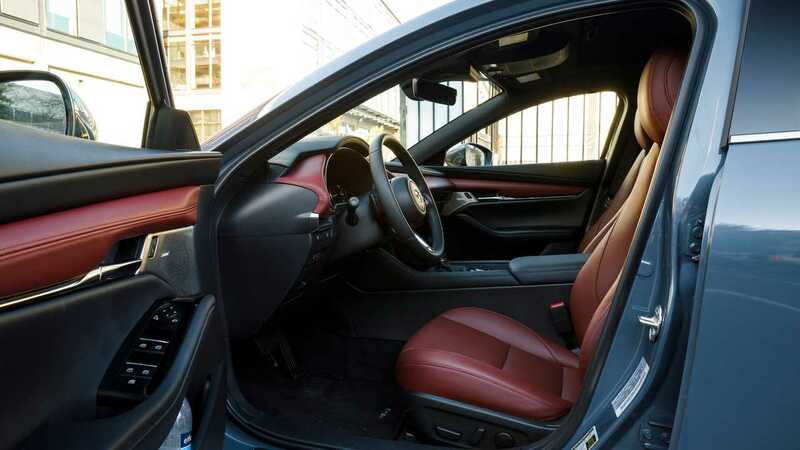 During a brief GVC demo, the Mazda engineer sitting in the passenger seat (armed with a very heavy-duty laptop) pressed a few buttons and switched the system off. The car immediately stepped out more at turn-in and was generally harder to keep in line past the apex. After a few minutes, he reactivated the system and the 3’s character instantly reverted back to being more stable. After our morning in the snow, we set out on a lovely stretch of mountain roads that took us from high elevation all the way down to sea level. 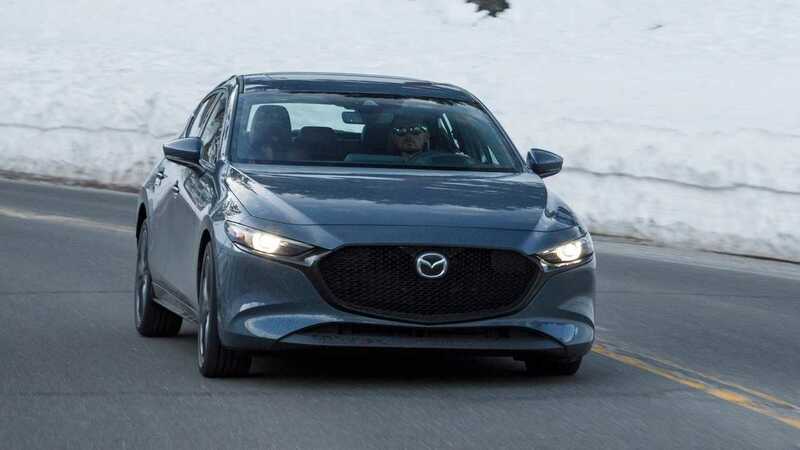 The combination of long sweeping turns with the occasional technical hairpin served as the perfect stage for the Mazda to show off its moves on the pavement. The steering feel is heavy at lower speeds, but provides clear feedback and gives the car a very controllable demeanor. Similarly, the chassis behaves with poise through the bends, resisting body roll at just about every corner. This leaves the impression that it can handle much more than 186 horsepower (cough, Mazdaspeed3). Mazda’s move to a torsion-beam rear suspension as part of the 3’s redesign caused quite a stir when the car debuted last November, but let’s calm the uproar and quell the worries: the new 3’s overall suspension setup is well-damped and strikes a great balance between comfort and agility, complementing the 3’s personality, rather than hindering it. Mazda engineers claim the simpler suspension can handle stiffer springs for better handling, but without making the ride too firm. After a day pushing the 3 hard, I have no reason to disagree with this claim, as the ride felt appropriately cushy for its segment, but firm enough to make 3 fans happy. Mazda engineers claim the simpler suspension can handle stiffer springs for better handling. As we carved through the Sierra Nevada Mountains, the 3's naturally aspirated engine started to struggle. Altitude is no friend to this 2.5-liter, and the extra 200 pounds of all-wheel-drive system don't help. Mazda doesn’t list an official zero-to-60 time, but nine seconds feels like a good guess. Unfortunately, the new 3 does not come with the benefit of added efficiency. The front-wheel-drive hatchback with the six-speed automatic transmission achieves fuel economy figures of 26 miles per gallon city, 35 highway, and 30 combined. Equipped with all-wheel drive, the new 3 hatch gets 24 mpg city, 32 highway, and 27 combined. For reference, a similarly equipped Subaru Impreza achieves 28 mpg city, 38 highway, and 32 combined. The Mazda does eclipse the Volkswagen Alltrack, which does 22 city, 30 highway, and 25 combined. Mazda’s changes to the 3 – both inside and out – make it even more compelling in class being abandoned for crossovers. 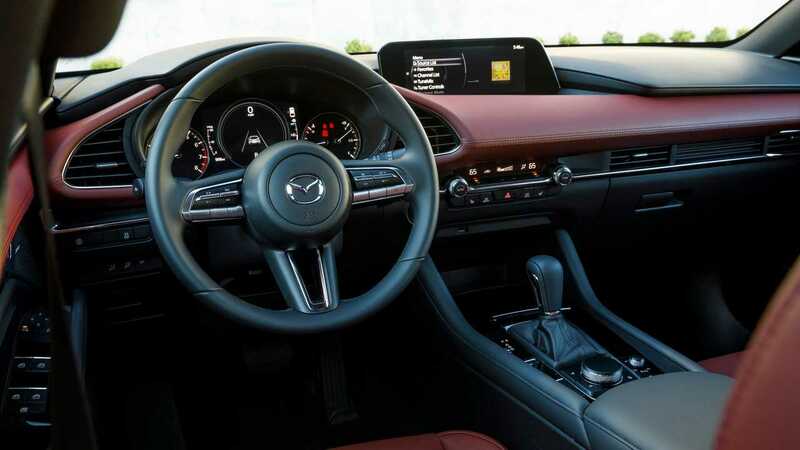 Although it concedes efficiency to its Japanese rivals from Subaru and Volkswagen, the Mazda feels a step above each of those cars with its premium interior and superior driving characteristics. For the money, it’s a seriously impressive compact that’s worth considering before buying a compact crossover. Pricing for the AWD-equipped Mazda3 starts at $24,000 for the sedan and $25,000 for the hatch. Loaded premium package cars go for $27,900 and 28,900, respectively. 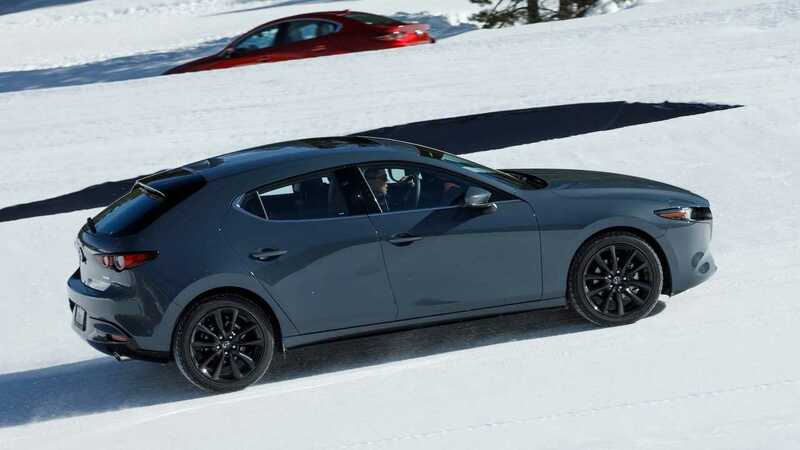 Both the FWD and AWD versions of the Mazda3 are now on sale.